How to make a treasure hunt for kids ? Make a Treasure Hunt requires a lot of thought and preparation to achieve a well-balanced and successful game. This is what I do, I invent treasure hunts for kid’s parties. I’ll give you all the advice you need to create a wonderful adventure that will delight your child and their friends at their next birthday party. I’ll provide step by step instructions, explaining all the important elements to ensure your treasure hunt is a success. 1- What format to choose for your treasure hunt? The treasure hunt format: The standard treasure hunt is the most familiar. Each time the players solve a riddle it leads them to where the next clue is hidden. The players continue in this way from hiding place to hiding place until they finally uncover the treasure. This simply requires creating the riddles which enable a hiding place to be guessed. This is the format I explain in detail here. Treasure hunts with maps: in treasure hunts with maps, the starting point is of course shown on a map. A plan of the site where the treasure hunt will take place is drawn on this map: a house, apartment, garden, town, village, forest, park, shopping centre, etc. The participants are led from point to point collecting the various markers hidden by the organiser. These markers may correspond to riddles or parts of a jigsaw. Together, these markers/riddles enable the location of the treasure waiting to be found. Firstly, the age of the children will influence the length of your treasure hunt. Children under 6 have a concentration capacity of around 40 minutes. For children over 8, one hour is a good length during a party. The puzzles should be adapted to the age of the kids: neither too easy, nor too complicated. Finding the right balance is one of the most difficult things for a treasure hunt designer. The location: a house, garden, shopping centre, park or forest, there are so many places where you can organise treasure hunts. This will influence the content of the riddles, for as we have explained, it is the riddles that enable the hiding places to be deduced. Here are a few examples of riddles and clues to use when designing a treasure hunt. Each riddle enables a location to be guessed. 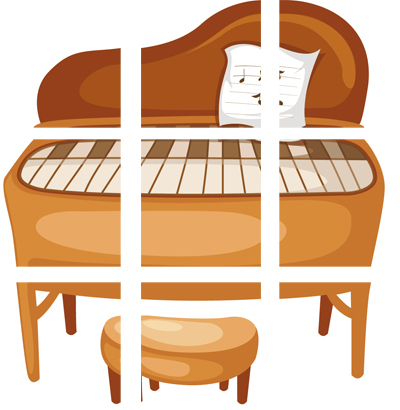 Rebuses are a series of drawings which, once interpreted, give the syllables for a phrase or word. These can be used to create words or phrases that are used as clues for the treasure hunt. Here is an example of a jigsaw, once solved it suggests that the children should go and look for the next clue near the piano. To make a jigsaw, simply take a photo of the hiding place of the next clue, print it, and then cut it into several pieces. Here is an example of a puzzle where you have to use a code to discover the hidden word. This example is taken from a treasure hunt in French, the word in code being door. Here is an example of a riddle to enable the children to guess that the next clue in the treasure hunt is waiting for them near a comb (i.e. in the bathroom). "What has teeth but doesn’t bite?" Preparation: this is what takes the most time; you need to invent several riddles, subtly balancing the difficulty level. Making the treasure: the treasure itself is the grand finale of your treasure hunt; a shoe box wrapped in brightly coloured paper is perfect. You can fill it with fake pieces of gold, small packets of sweets or small toys, for the guests to share and take home. 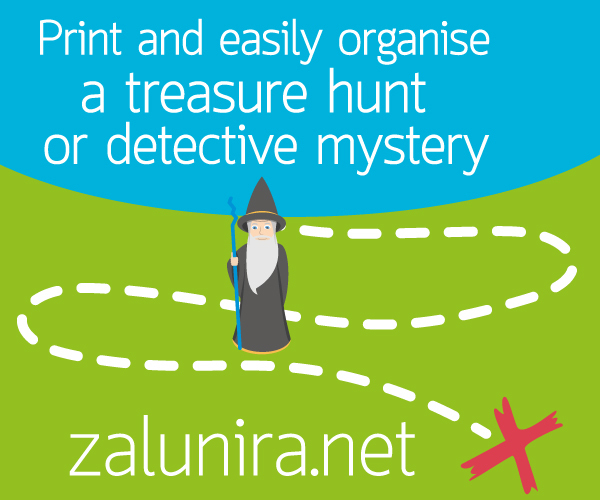 Use the code ALUNIRA-EN to enjoy a 20% discount on en.zalunira.net, the online store for read-to-print treasure hunts and detective mysteries.